HARTFORD, Conn. -- The game(s) of the year in the Big East are upcoming between Georgetown and Syracuse and Syracuse and Louisville in the final three weeks of the season. The game of the conference going forward occurred Thursday night and will again next Saturday in Cincinnati. UConn beat Cincinnati 73-66 in overtime Thursday at the XL Center. The two teams have played competitive games, usually down to the final possession, in the past five years. The games have been physical but fair, always intense but respectful. 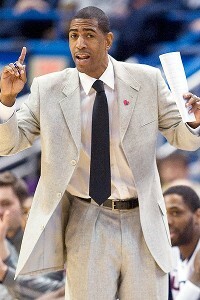 AP Photo/Jessica Hill, Kevin Ollie has UConn headed in a positive direction despite being ineligible for the tourney. The new Big East, the one that for now will have the name, will need to be anchored by Cincinnati and Connecticut going forward. They are the two most established programs left behind after others fled to the ACC or chose to soon form their own conference. Like it or not, Cincinnati and Connecticut are linked together. They both desperately wanted to be in the ACC but were passed over for Louisville. They would still jump at the chance to join the ACC and may if the Big Ten completes its British Empire-like expansion and gobbles up more land (grant-universities) areas out of its geographic footprint to get to 16. The Big East looks like it will survive after a healthy competition between ESPN and NBC Sports to secure media rights, with sources confirming that ESPN matched NBC's offer. Barring a hiccup, ESPN will retain/acquire the new league's rights for the next seven years. The Big East will have 18 members for next season, barring a last-minute dash by the seven Catholic schools. In 2014-15, Louisville and Notre Dame will be gone to the ACC, Rutgers to the Big Ten, and the Catholic seven to a new league. That will leave UConn, Cincinnati, South Florida with newbies Memphis, Temple, Central Florida, SMU, Houston, Tulane and likely East Carolina for a 10-team league. Adding Tulsa and/or UMass to increase the membership to 11 or 12 in all sports is possible. Memphis and Temple have rich histories in men's basketball. But the new Big East will need anchors, programs that have been established to help shepherd in this new era. The only choices are UConn and Cincinnati. After the game Thursday night, UConn coach Kevin Ollie said rivalries are with your conference foes and acknowledged that there is something healthy brewing between the Huskies and Bearcats. "I think it already is (a rivalry)'' said UConn athletic director Warde Manuel. Manuel tossed in South Florida as well as a program committed to football and basketball. But this is strictly a men's basketball discussion and for the league to have a chance, UConn and Cincinnati have to maintain a high level of play, bring in NBA-type talent and play games down to the finish -- like Thursday night -- to keep viewers interested. UConn, which would be an NCAA tournament team if it were eligible but is not due to an APR postseason ban, frustrated the NCAA-bound Bearcats by taking advantage of poor Cincinnati execution down the stretch and Shabazz Napier getting free for three 3s in overtime. Cincinnati coach Mick Cronin labored over the "inexcusable mistakes'' toward the end of the game and the need to play smarter. 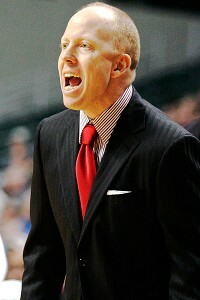 AP Photo/Skip Peterson Mick Cronin's Cincinnati Bearcats are a natural rival for UConn. But Cronin also spoke of the Big East's grind and how the league shows no mercy. The Bearcats are in a stretch where they played Pitt (loss), Villanova (win), Georgetown (loss), at UConn (loss) and play at Notre Dame, at Louisville and get UConn at home in the next week. When the league splits, the gauntlet of conference games will mostly consist of two games against UConn with the hope that Memphis and Temple can be tough as well, albeit maybe not as intense. Cronin said the key will be for both schools to continue to recruit at a high level. That's a given. But the players are already feeling as if there is something between the two schools, regardless if they'll be there when the league breaks up. And the underclassmen and incoming recruits better as well. They are all stuck together until there is another shift in expansion. Who knows when that will occur. For now, UConn and Cincinnati have to be the two anchors of a league that desperately needs them to be elite.